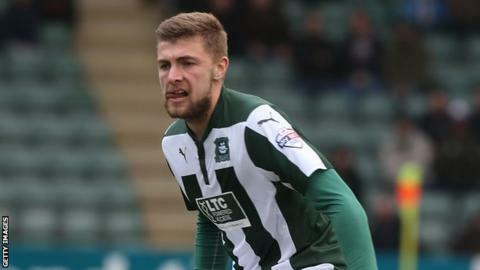 Ryan Brunt's injury time strike ensured Plymouth remained top of League Two after a hard-fought victory over Luton. Argyle went ahead after just 15 minutes as Carl McHugh headed in Craig Tanner's cross from the right. Luton almost levelled when Jack Marriott's cross-shot was turned away by Luke McCormick, who then saved Cameron McGeehan's strike but could not keep out Josh McQuoid's header. However, Brunt's late close-range finish handed Argyle all three points. Luton Town boss John Still on Plymouth defeat. "Everything went against us today, the three substitutions, player sent off. We came from a goal down, we've tried to win, I didn't want to try and draw! "I have no complaints about the late goal, the players have done fantastic. In the other games I would have complaints because they were different situations, we had a proper, up and at them, let's try and win this game attitude." "It's a penalty, we've seen it, with the greatest of respect the assessor said it was a penalty, no doubt about it, but there's nothing we can do about that. " Match ends, Luton Town 1, Plymouth Argyle 2. Second Half ends, Luton Town 1, Plymouth Argyle 2. Goal! Luton Town 1, Plymouth Argyle 2. Ryan Brunt (Plymouth Argyle) right footed shot from the centre of the box to the high centre of the goal. Second yellow card to Ryan Hall (Luton Town). Substitution, Plymouth Argyle. Oscar Threlkeld replaces Gregg Wylde. Ryan Hall (Luton Town) is shown the yellow card for a bad foul. Craig Tanner (Plymouth Argyle) is shown the yellow card. Corner, Luton Town. Conceded by Gary Sawyer. Attempt missed. Cameron McGeehan (Luton Town) left footed shot from the left side of the box is close, but misses to the left. Attempt missed. Curtis Nelson (Plymouth Argyle) header from the centre of the box misses to the left. Corner, Plymouth Argyle. Conceded by Alex Lawless. Corner, Plymouth Argyle. Conceded by Ryan Hall. Goal! Luton Town 1, Plymouth Argyle 1. Josh McQuoid (Luton Town) header from the centre of the box to the bottom left corner. Assisted by Cameron McGeehan. Attempt saved. Gregg Wylde (Plymouth Argyle) left footed shot from outside the box is saved in the centre of the goal. Substitution, Plymouth Argyle. Lee Cox replaces Peter Hartley. Hand ball by Nathan Doyle (Luton Town). Attempt saved. Carl McHugh (Plymouth Argyle) header from the centre of the box is saved in the centre of the goal. Substitution, Plymouth Argyle. Josh Simpson replaces Hiram Boateng. Attempt saved. Nathan Doyle (Luton Town) right footed shot from outside the box is saved in the bottom left corner. Attempt missed. Cameron McGeehan (Luton Town) header from the centre of the box misses to the left. Substitution, Luton Town. Josh McQuoid replaces Pelly Ruddock because of an injury. Second Half begins Luton Town 0, Plymouth Argyle 1. Substitution, Luton Town. Ryan Hall replaces Sean Long. First Half ends, Luton Town 0, Plymouth Argyle 1. Sean Long (Luton Town) wins a free kick on the right wing. Attempt missed. Craig Tanner (Plymouth Argyle) left footed shot from outside the box misses to the left. Nathan Doyle (Luton Town) is shown the yellow card for a bad foul.